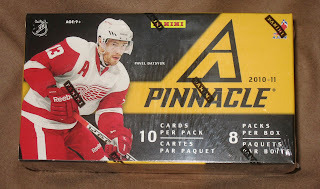 Just before Blogger “shut down” we posted a video box break of a 2010-11 Pinnacle Hockey Blaster. Now that Blogger is back, our post of the box break is gone. You may call it a conspiracy theory, but we are positive the 20.5 hours of “maintenance” was an elaborate plot by Blogger to try and hide the truth... that blasters of 2010-11 Pinnacle Hockey have magical powers. Let’s see how long this post stays up, Blogger! We used our video box break to predict the outcome of Thursday night's Red Wing – Sharks game. With one goal scored for every corresponding player card pulled, the blaster revealed to us that the final score would be Detroit 2, San Jose 4. "Correct winning team... yes. Close on the score... yes. But maybe not so magical." you say. Perhaps... until you look carefully at the cards pulled. The first card we pulled was San Jose Sharks goalie Antero Niittymaki. He never hit the ice Thursday. All other players pulled did have shifts and playing time. If you disallow Niittymaki’s card, not only do you wind up with the correct score, you also wind up with the correct sequencing of how the goals were scored. Any doubters left? I think not. See for yourself the power of the blaster. 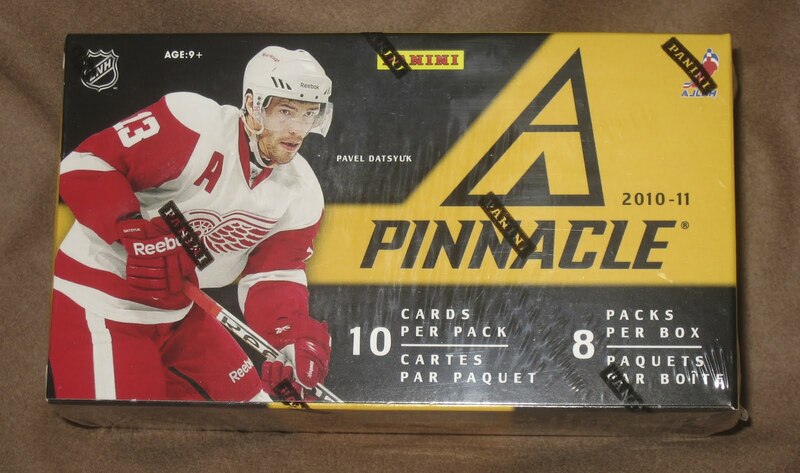 The winner of tonight's Detroit Red Wings / San Jose Sharks game revealed to us in blaster of 2010-11 Pinnacle Hockey. People love to speculate. When it comes to sports, there is endless conjecture about the outcome of important games. Vegas lays odds, sports radio offers hours of statistical analysis, sometimes video games, like Madden , are used to simulate play to determine the winner. But in the end, all of this doesn't matter because it's about athletes on the field of play where any team can win on any day and, ultimately, the outcome is all in the cards. We opened a blaster of 2010-11 Pinnacle Hockey and the final score of tonight's game was revealed to us. Watch this box break video to see for yourself who will go on to face the Vancouver Canucks for the Western Conference title. And make sure to come back here to All About Cards after the game for details on our Stanley Cup Playoffs Contest. You guys should do this more often...in fact do this for the Stanley Cup Finals! Was it just me or were there like 8 or 9 Canucks cards in that one blaster?